“People who are computer experts or who work with computers do say Expedite is their patron saint,” said the Rev. Michael Amesse, pastor of Our Lady of Guadeloupe Chapel in New Orleans, the only American church with a statue of the saint. Oh, this makes great sense. Just look how short the guy’s legs are from not getting any exercise. And see his arms? They’re longer than his legs from stretching toward the keyboard to hack away. I think he’s wearing Chuck Taylors with his cleric costume. Must have been a wicked LARP session! What a question. Who could be the patron saint of the Hacker scene, but a Woman called Kerstin (Germanic for Christina i.e. “The anointed one”) Hack. 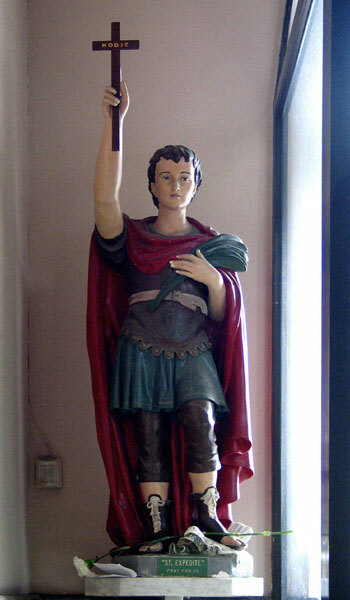 Please pray to St. Expedite. I was in a financial jam and am now in the process of getting out of it, thanks to him. Spread the word….